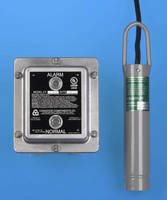 Designed for dry bulk material level indication and control applications, UL Listed Control Units have cast aluminum housing fitted with LED Indicator lights that alert operator to presence or absence of material. Control unit allows for 5,000 ft (max) of cable between itself and probe, permitting placement of Control Unit in accessible area. Supplied with shock- and vibration- resistant SMT PCB, product comes inÂ 3 models for use in different environments and has 5Â A DP/DT output relay. The new generation of Tilt Level Controls is designed for dry bulk material level indication and control applications. These new UL Listed Control Units are enclosed in a rugged cast aluminum housing with LED Indicator lights to alert the operator of either the presence or absence of material. Equipped with a new Surface Mount PC Board the unit now allows for a maximum of 5,000 feet of cable between the Control Unit and Probe, permitting placement of the Control Unit in an easily accessible area. The Control Units are available in three different Models for use in different environments. The Model CT-105 Control Unit is NEMA Type 4, 4X for use in general purpose outdoor applications and is dust proof and weather tight. The Model CT-106 Control Unit is NEMA Type 9 Class II, Groups E, F and G for use in hazardous locations. The Model CT-107 Control Unit is NEMA Type 7 Class I, Groups C and D explosion proof; NEMA Type 9 Class II, Groups E, F and G dust ignition proof construction for use in hazardous locations. When suspended from a fixed support, the Probe indicates material is present when it is tilted a minimum of 15° for the mercury version or 25° for the non-mercury version. The surface mount PC board is resistant to shock and vibration and has a logic selector switch and adjustable time delay to prevent false signals. The Control Unit has a 5 amp DP/DT output relay. Two Probe sizes are available. The CT-200G is a compact, 6 inch Probe for use on small bins and hoppers where space is limited. The CT-201G is our standard 9 inch, heavy duty Probe for applications where an abrasion resistant Probe is necessary. The probes are intrinsically safe and UL Listed only when used in conjunction our control units Models: CT-105, 106 and 107. Both Probes are available in stainless steel for corrosive environments and optional fittings are available to permit easy suspension from fixed supports. Paddle options are available for use on moving materials as a flow indicator. Probes are air tight, dust tight, waterproof and come with a standard 25 feet of three conductors 16-3 S0 cable. Additional cable lengths are available up to 5,000 feet. If you would like additional information on this or other products that Conveyor Components Company offers please contact their sales department toll free 800-233-3233, fax 810-679-4510, e-mail info@conveyorcomponents.com or visit their website at www.conveyorcomponents.com. Hospital Bed Inclinometers promote healing. Inclinometer features frequency response of 2 Hz. Inclinometer targets sailboats, cruisers, and sport boats. MEMS-Based Inclinometer survives harsh environments.